January 28, 2019 January 30, 2019 by Julie Gaston . Posted in " Uncategorized " . 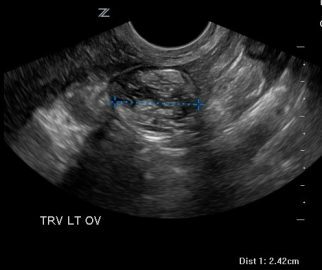 Patient presented with a positive urine pregnancy test, cramping and an LMP with a gestational age of 9w3d. The exam began transabdominally. While this may not be the prettiest view of the baby it gives the practitioner an overview of the entire pelvis. 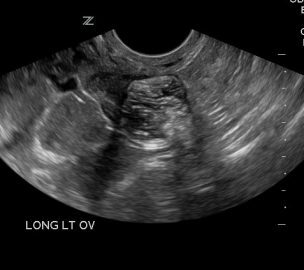 Here you can see that this is an anteverted uterus. 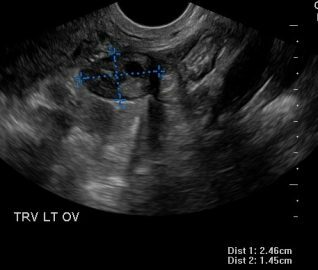 There is an intrauterine pregnancy within the uterus and the uterus is a normal size with no evidence of fibroids or other abnormalities. Vaginally, you can see the cervix (left) and fundus (right). This is a sagittal slice of the cervix then following the endometrium to the fundus. 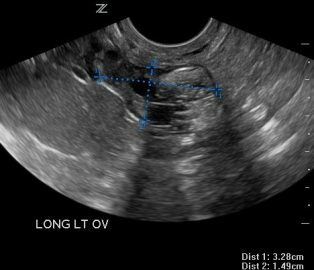 Once this is achieved, it is important to sweep right and left to fully evaluate the uterus. Above you can see that the CRL measures 1 cm with equates to 7w1d. This is significantly smaller than the LMP suggests. Upon evaluation of the fetal pole, the practitioner was unable to visualize a beating heart. That prompted the use of color Doppler to look for flow. 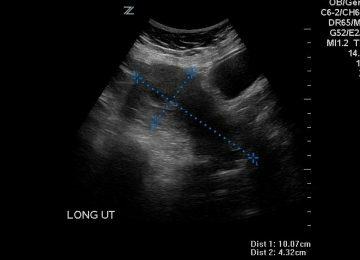 The lack of color flow and heart flicker required the use of PW Doppler to insure no fetal heart tones where missed. 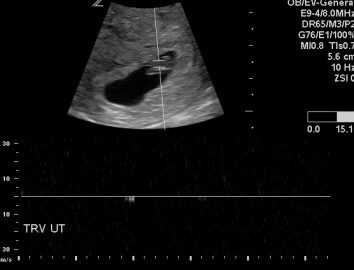 And below you can see that there was no fetal heart motion detected. Remember that we should be using M-mode in the first trimester. However, when you are unable to see any motion, it is best to use PW to be certain. A cine clip showing lack of motion is suggested as well. 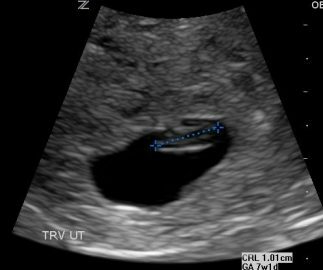 An evaluation of the adnexa is included in the first trimester ultrasound exam. 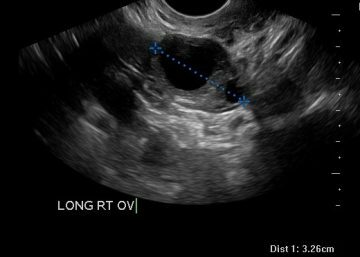 Upon inspection of the left ovary the practitioner noted an echogenic mass. See images below. 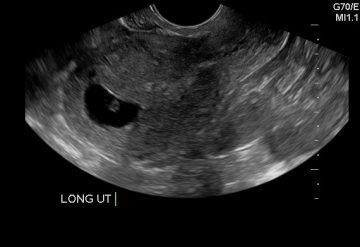 The first image (left) shows a normal left ovary. 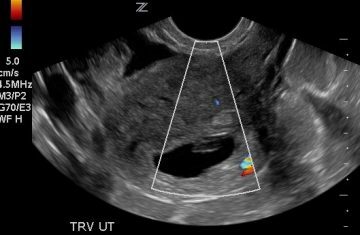 But while sweeping through the practitioner noticed the echogenic mass on the inferior portion of the ovary. This echos the importance of sweeping through each organ that your are evaluating. 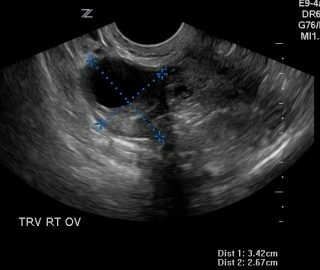 The image on the left is a sagittal image of the ovary and the image on the left is a transverse slice. The appearance of a dermoid vary greatly depending on what they are made of. 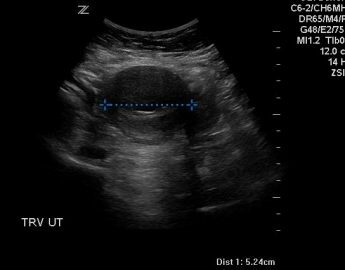 This particular one was mostly fat and the lack of calcification did not give the “tip of the iceberg” appears that is common. 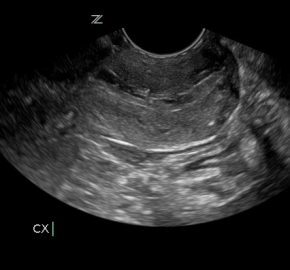 The findings of this case were a fetal demise at 7w0d and an incidental finding of a left ovarian dermoid.